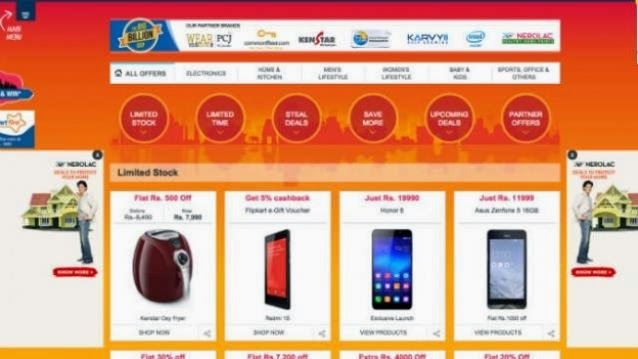 Flipkart turns into Flopkart on Big Billion Day sale. With Flipkart's 'Big Billion Day' sale on 6th October 2014, it also gets millions of unhappy customers. Flipkart draws wrath on its big billion day as there are cancellations of order from Flipkart side, website crashed at the begining, varying prices, out-of-stock issues and many more to count on. So, to make up with their millions of unhappy customers, Flipkart is sending Apologies Letter with names of Sachin and Binny to its customers. Here is the mail that I received few hours ago. Flipkart should rewards there customers to make them happy. They should get prepared for the next sale. Infact, they must have learnt the lessons from the sale of Xiaomi Mi-3 phones. But alas they haven't and now they are getting scolded by once trusted customers for cheating and giving poor services. Hope that next time these #Flopkart, #Failkart tags should not trend in Twitter or Facebook, only the #BigBillionDay hash tag on Twitter gets trending.